Summer is officially on and poppin’ in Atlanta, but if yours remains on the "eh" side of awesome, prepare to kick it into overdrive. We’ve rounded up 50 ways to have zero regrets come fall, from what to eat and drink, to what to do and see. It’s about to get HOT. 1. Nothing says “summer” like, well, saying the word “summer,” but also eating slow-smoked, flame-grilled meats that’ve been marinated and painted with sweet/savory sauces. And nothing excuses overconsumption of ‘cue like eating lots of it with lots of people at the Atlanta Bar-B-Q Fest. 2. Little Trouble’s chilled soba ramen involves blueberries, shiitakes that will blow your tongue’s mind even if you hate mushrooms, edamame and cherry tomatoes. They take it off the menu when the weather cools down, or whenever they feel like it (probably the latter), so eat as much as you can now. 3. Sure, you could settle for Dairy Queen. Or you could keep your ice cream experience local, smack some sense into yourself and enjoy sweet, creamy heaven from Morelli’s, Jake’s, Queen of Cream or other ATL-based scoop shops. 4. Remember that local ice cream we just told you about? Now eat that, and ALL THE REST OF THE ICE CREAM THAT EXISTS, when the Atlanta Ice Cream Festival hits Piedmont Park around the end of July. If your doctor protests, just tell her to chiiiiilllllllll. 5. It’s not on the menu at Hampton & Hudson, but they have housemade beef jerky and you need it. It’s lean, room temperature and it’s balanced between moist and dry, marinated in a soy/Worcestershire sauce blend. Ordering it will make you look so very keen, since it’s an off-menu item at a very new restaurant/bar. 6. It’s not hard to find one of the King of Pops stands propped up on popular street corners, but if you don’t have time for that foolishness (and who does, when it’s hot as hell outside? ), just head to their shop at Ponce City Market. Try the Sweet Tea & Lemonade version. 7. Only available July 1 to August 31 at Davio’s Atlanta are boozy granitas: homemade, spiked Italian ice treats, which you can enjoy on Davio’s covered front patio for just $12 apiece. While you’re there, try the new Surf N’ Turf Burger, which stacks Kobe beef with Maine lobster on a brioche bun, with a side of truffle fries. You so fancy! 8. Vine & Tap just opened a new side hustle lunchtime counter called Lobster Shack, where boxed lunches from the haddock sandwich to the lobster roll will help you pretend that Buckhead is actually the northeast coast, which is also a pretty accurate description of how traffic will probably be moving on Lenox Rd while you watch with pity (and with a lobster roll) from V&T’s patio. 9. Chef Ford Fry is one of ATL’s foremost restaurateurs, and Superica, his “Mex-Tex” eatery at Krog Street Market has a fabulous patio where you can have chilled raw seafood bites from aguachile (shrimp in citrus-habanero lime juice) to red snapper with jalapeno, cucumber and lime. 10. Crush mouth-cooling rolls at O-Ku Sushi, such as the salmon/ kani tempura/ lemon slice/ cucumber “Marilyn Mon Roll”, striped bass sashimi, or the daily chefs’ special crudo plate, while taking in panoramic views of Midtown from O-Ku’s brand new 1,500-sqft rooftop patio. 11. Buckhead’s bar scene has recovered from its pre-2000 decimation. Now your options include exploring the area near the Peachtree/Roswell roads triangle, where Churchill’s Pub, Buckhead Saloon, Big Sky, Genki and Dive Bar are all located. You could also opt for a Buckhead hotel trip, including an escapade at Bourbon Bar (inside InterContinental Buckhead Atlanta), or Cook Hall, where you can get DIY-ish on personal cocktail kits. 12. Pick from a gang of watering holes right on the main strip of Virginia-Highland (Highland Ave) and create your own excursion, from Atkins Park to Highland Tap, Dark Horse Tavern and T. Mac, and many more. Or just join a jaunt that’s already planned, such as the one where everybody dresses like a zombie on July 30. 13. You’ve got more than a couple options for beveraging near Inman Quarter, whether you’re below street level at just-opened Hampton & Hudson, curbside at Beetlecat, or getting your Spanish on, duh, at Barcelona. 14. East Atlanta Village is a great place to drink and scene-stalk, whether you want live music at The Earl, crafty concoctions from Argosy, or anything that pours at The Midway Pub, Flatiron Bar, Graveyard Tavern, Union EAV or others. 15. There’s even great drinking near Perimeter, at the top of I-285. The Pub, which is attached to Perimeter Mall, has fantastic happy hour specials on drinks and food. Sage Woodfire Tavern, located across the street, is a more sophisticated spot for the after-work set. The Brass Tap, a upscale-yet-relaxed sports bar which opened recently near Sage, offers live music on weekends and stocks over 300 craft beers, which they've made searchable on their website by your preference of style, origin and ABV. 16. Restaurant Nine Mile Station opens in August at Skyline Park, the brand new rooftop-boardwalk-carnival-playground on top of Ponce City Market. Along with panoramic views of the city, it will offers local brews, family-style dining, and an indoor/outdoor bar. 17. Keep your energy up this summer at ATL’s organic juice bars, from Nature’s Garden Express at Krog Street Market to dtox juice in Westside Provisions, and Arden’s Garden retail shops. 18. Those high-90s temperatures can be a drain on your energy, and no matter what those naturalists tell you about drinking hot beverages to cool down, you know that makes no damn sense. So support ATL businesses and have the Wanderlust crew setup their iced coffee bar at your house or wherever you’re feeling the burn. 19. The BeltLine, Atlanta’s revitalized city-looping walking path is still being developed, but the eastside trail will put you around Old 4th Ward and Inman Park at Victory Sandwich Bar, as well as Two Urban Licks, Loca Luna and lots of other bars near Piedmont Park. 20. Start a downtown excursion at White Oak Kitchen & Cocktails, then walk down to Centennial Olympic Park, going from Park Bar to Der Biergarten, with a pit stop at Googie Burger. Because summer, without a little heat, would be pretty boring. 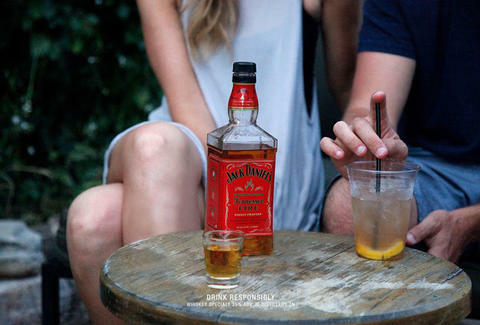 You can add even more spice to your plans by escaping with Jack Fire, a smooth whiskey with a red-hot cinnamon finish. 21. You can find several wineries in the mountain-surrounded town of Dahlonega just 90 minutes northeast of Atlanta, including Wolf Mountain, Frog Cellars, Cavendar Creek and Montaluce. They’ve also got lots of tasting rooms downtown in case you need time to make up your mind. 22. Athens, home of UGA, Creature Comforts and other great folksy attractions is not even an hour away. And the bar scene is solid. That also goes for eating, because even though ATL stole Hugh Acheson, his landmark supperhouse Five & Ten is a must-do for food-enthused folks. 23. Ride just over an hour east on I-20 to Lake Oconee for natural splendor and some of the best golfing outside of Augusta. You’ll find comfy lodging from under $50 to considerably pricier suites at The Ritz-Carlton Reynolds Plantation, and there are all sorts of waterborne activities to get into, from flyboarding to pontoon cruising. Oh, and be sure to eat at Linger Longer Steakhouse while you’re there. 24. Prolific artist Howard Finster created and collected almost 50k works of art in his lifetime, two of which were done specifically for rock bands R.E.M. and Talking Heads. Paradise Garden, the four acres of land where his works can still be seen today are full of some of the funkiest folk art you can find anywhere. 25. You could be a hybrid between Mr. T and that guy from The Walking Dead with the barb-wire-wrapped baseball bat, and you’d still fawn over the flora you find at Callaway Gardens. Quit acting so hard all the time and enjoy what looks like billions of flowers all around you, you big pussycat. Is that a tear? 26. The ride to Chattanooga is an hour and a half up I-75 North, and feels almost as much of a breeze as you get when you’re high above town, gazing out from Lookout Mountain, down on Main Street grabbing pizza or beer, or crossing over the Tennessee River on the walkable Riverpark bridge. 27. Check out the tallest cascading waterfall in Georgia at Amicalola Falls State Park. It’s a one-hour, exceptionally twisty journey, so designate your driver with care. You know, that friend who never sweats it. 28. It might take less than an hour for you to reach Barnsley Resort in the Blue Ridge Mountains. Make the most out of that extra earned time by mountain-biking, paintballing and golfing on a championship course. 29. You might feel St. Elmo’s Fire burning in you when you get to the top of Brasstown Bald, Georgia’s highest mountain. The observation deck is 5k feet above sea level, and offers views of Georgia’s four nearby states. Plus you can get country snacks like hot boiled peanuts at local grocers down on the roadway. 30. Lake Lanier’s one-mile beach may be man-made, but that doesn’t mean the islands are any less appealing, especially if you’re in the mood for fishing, camping, hiking or waterpark activities. 31. King of Pops hosts Yoga In The Park, a free weekly gathering of thousands at Historic Fourth Ward Park on Tuesdays. Breathe, stretch, shake, let it go with hundreds of new, “namaste”-ing friends. And eat a popsicle. 32. Should you spend a day competing in a giant paper-airplane toss? Pushing people around, or letting them push you, in a wheelbarrow race? Entering an obstacle course with giant Jenga and Connect Four setups? 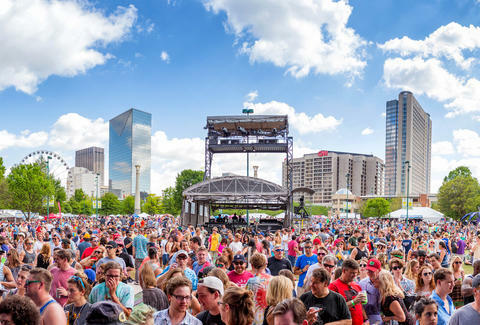 YES, you should: attend Atlanta Field Day. 33. Running fast is more fun and less painful when you make other people do it with you. Register your team of two or four for The ATL Relay 10k and 20k now, and have a grand time sprinting around Castleberry Hill. 34. Do you believe? Can you run? If you answered yes to one or more of those questions, sign up for the extraterrestrial-themed 5k Area 13.1. Dress like an alien, and run. 35. You don’t just run in the Jogger 5k -- you run through The Goat Farm Arts Center, Westside Cultural Arts Center and other spots where paintings, installations and more creative works will be displayed for your running-while-viewing pleasure. It ends at Monday Night Brewing, so self-improvement is not your only goal. 36. Why wouldn’t you attend Imagine Music Festival, a three-day electronic music festival at the Atlanta Motor Speedway? You can attend normally Aug 26-28, or get the VIP treatment which comes with clean, cool toilet access, Champagne toasts, expedited entry and pit access. Hell, you could camp(/ball) out in an RV and park in an area that overlooks the entire festival grounds, with private security. Imagine THAT. 37. Don’t let the fact that artsy people leave an assortment of doll heads sprawled around a nature preserve, named it Doll’s Head Trail, and left signs freak you out (okay, a little). It’s a beautiful hike, there are plenty of people around to reassure you that it’s not a murder trap, and the entire artistic message is about not littering. But still, maybe don’t do it alone. 38. It’s legal to spray-paint the partially city-owned, partially privately held Krog St. Tunnel, which connects Cabbagetown and Inman Park. They, whoever “they” are, quietly white-wash it every few weeks or so, allowing creative types to start over, and nobody goes to jail because it’s kinda supposed to be tagged. So be sure to take a picture; it’ll last longer. 39. Pick from 200 hard rock, punk, and glam tunes, backed by a live band, at Metalsome heavy metal karaoke every Tuesday. It literally rocks. Get there early for a free slot, and pay $20 (or whatever they say) if you want to go again, or perform a duet with a friend. How the hell can you respectably pull of “Wanted Dead or Alive” without a fake Jon Bon Jovi (you) and a fake Ritchie Sambora (whoever)? 40. Yes, the Weeds & Wine event sounds illegal, but it’s actually a great way to tell people you did something great for the environment this summer. Don’t mention that you were motivated by the free booze that neighboring restaurants and bars give volunteers who come every week and help remove invasive weeds near the Atlanta BeltLine Arboretum so that the trees, native plants, and grass look more visually appealing. Say you did it because you love Atlanta. 41. While it’s always lovely at Atlanta Botanical Garden -- and especially so in the summer -- you should get there before October 30 to see Chihuly In The Garden: amazingly colorful/trippy glass sculptures that add sparkle to the natural scenery. 42. Music business veteran Shanti Das promotes ATL Live on the Park, a monthly event next to Piedmont Park where soul, R&B and hip-hop talent performance inside an air-conditioned (don’t worry) tent. 44. House music is enjoying a major resurgence right now, but House In The Park has been bringing Chicago’s pulsating party music to Grant Park for 11 years now, thanks to some of ATL’s best deejays and free admission for 15,000 vibe-feeling, rhythm-seduced humans of all sorts who love to dance. 45. Beer, Cheese & Soccer is exactly what it sounds like. You drink beer, eat cheese and watch soccer with soccer fans. The simple things in life are sometimes the greatest. 46. You can roll, bounce, fall and recover with a smooth glide at Cascade Fun Center, the Southwest ATL roller skating ring where the movie ATL was filmed, and which is frequented by many a celebrity just looking to test their skills like anybody else. You could fall in front of a hero. 47. The historic home of the Candler family hosts Callanwolde Jazz on the Lawn through the first week in August -- as the name suggests, right on the grass. Go there and wax lyrical about the genius of Coltrane. 48. More than a dozen art galleries and businesses in the west-of-downtown community participate in the open-door monthly Castleberry Hill Art Stroll. Check the list of all the art collections within short walking distance of each other, and pause for a drink or two. 49. The fact that the Atlanta Ballet once performed with Big Boi from OutKast makes them eternally street-credible. Get tickets now to see Wabi Sabi, their summertime performance series of Japanese-inspired choreography on the Atlanta BeltLine’s just-opened rooftop at Ponce City Market, and Serenbe Playhouse in August. 50. Every fourth Sunday at Space2, a collective of freestyle rappers, backed by DJ Jamad, get together for Soul Food Cypher. They don’t know what the heck they’re going to say, and they don’t know if it’ll go well, but they just go. And it’s a beautiful, creative expression of hip-hop art and culture, which if you didn’t know, is controlled globally by what city? You guessed it… Atlanta. Mike Jordan is an Atlanta-based creative guy who doesn’t take summers off. He also hosts a monthly literary karaoke event called Lit. Find out more about it at @LitAtlanta on Twitter, and keep up with him at @michaelbjordan.